For many years in the 1960s and early 1970s small scale armor - usually either 1/87 or 1/76 – dominated armor modeling circles. But in 1968 Tamiya began making relatively accurate kits in 1/35 scale, joined soon afterward by Nichimo and Italeri, and the change to large scale modeling was on. In the early 1970s Hasegawa started a line of 1/72 scale kits and was soon followed by ESCI, but the former were somewhat odd and the latter basically pantographed versions of existing Tamiya or Italeri kits. For about 15 years there was pretty much a lull, but in the mid 1990s many companies began to relook the scale and come back into it. Since 2000 there has been a virtual explosion, much of it fueled by Revell Germany, Trumpeter, DML, and a host of new companies from eastern Europe. Many of these new generation kits are very impressive and some are superior to their larger 1/35 scale brethren. Tokso is a new company from China and this is their first kit, followed by a series of 1/72 artillery pieces such as the M114 155mm and the sFH 18 15 cm howitzers. With the recent release of a new SCUD B kit from Trumpeter, this kit attracted my attention at the AMPS 2015 show and I picked one up out of curiosity. I am not sure who actually owns this company (most of the mainland companies are under one or two umbrella organizations like the Wasan Plastic Company) but the moldings are crisp and petite. Slide molding was used to make the erection piston assembly but that is about the limit of involved molding. Many pieces did show a number of ejection pin marks on their faces which is disappointing. The carry-over shortcomings appear as follows. The basics are still there to make a good model but it will take work and after market additions (generally new wheels/tires and etched metal) to bring the kit up to speed. What you get in the box is the 9P117M1 version of the launcher, which did away with the self-loading features (big boxes and hydraulic arms on the sides of the elevation cradle) and made some minor changes to the central module of the vehicle (one porthole per side). The kit provides separate doors for the cabs and the central module, but detail is sparse by today’s standards (at the time DML made their kit only long-range shots of open doors were seen so nobody had a close-up view of the inside). The cabs were painted a seafoam green inside whereas the processing cabins in the central module were an orangish color. (We now know all systems are color coded – e.g. electric, fuel, water, air pressure and hydraulic lines are all painted different colors). 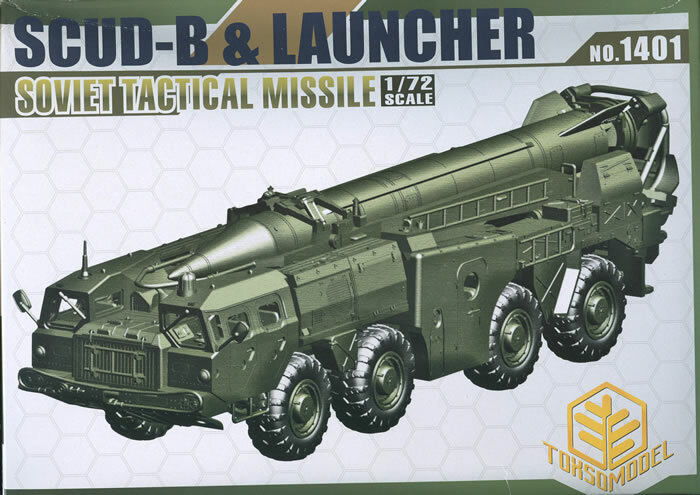 The model is assembled by modules – chassis with wheels, cabs/engine hood, service module, central module, launcher module, cradle and missile. Each one is pretty straightforward and the only major parts missing that I saw were the intra-module fenders (between the accessory module behind the cabs and the processing module amidships). The modules for the DML kit attached to the chassis in the order launch, central, service and cab/hood. Once they are in the fenders (.020" sheet should be fine) may be cemented between the central and service modules. A single sheet of acetate is provided for the 12 windows, and all of the window shapes are printed on the acetate. But the modeler has to cut them out as they are not prepunched. Three finishing options are offered: Soviet (dark green with markings), North Korea (dark green with markings) and Iraqi (sand with markings). A tiny sheet of decals is included.